Pluralsight – I’ve been following the excellent learning path from Greg Shields. These are focused on vSphere version 6, however, as you might expect, they do provide excellent material that is relevant to vSphere 6.5. They also work very nicely with the learning path from David Davis – which is primarily aimed at helping people with the foundations exam requirement. The combined material is excellent and goes a long way to providing what you’ll need to learn to pass both the foundations and VCP-DCV exams. I would highly recommend that you also follow along with the lab exercises, if you have a lab available. Everybody learns in different ways, and having the option to learn by doing is a real bonus. As a bonus there is a focus course on what’s new in vSphere 6.5 which is well worth reviewing, the exam is after all based on 6.5 going in blind to the new features would be – suboptimal. vBrownBag – If you don’t have a Pluralsight subscription then don’t despair, vBrownBag provide an excellent set of learning video resources. 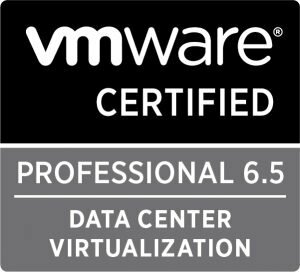 This is again focused on vSPhere 6, but as with the Plurasight learning paths they also provide excellent material that is relevant also the the VCP-DCV 6.5 certification. Hands on Labs – This is in my opinion one of the best resources available to the technology community, bar none. The ability to spin up an environment that provides you with administrative credentials into a vSphere SDDC deployment is priceless. Whether you are following the lab notes or free-styling your learning, this is a resource that you should use. Yes they can sometimes be a little slow to load and the interface a little clunky, but what other company gives you interactive access in this manner? What other company gives you access to a learning tool this powerful, for free! Do yourself a massive favour and start making use of them. A bit later into my studies I found the excellent practice tests for the VCP-DCV 6.5 exam offered by Simon Long on his SLOG website. These are broken down by blueprint section in addition to offering an ‘exam like’ quiz. For free, this resource is excellent. If you are following the VMware certification blueprints then you will know that in order to complete your VCP certification you also need to sit an instructor led training course. These courses are offered online via VMware education there is also the option to book instructor led on site courses. I know which one I prefer. Being able to get hands on time with a VMware certified instructor is something that should not really be passed up in my opinion. If you think the requirements for VCP are hard you should know that they are a magnitude tougher for the instructors. I was able to get a short notice place on an Install, Configure and Manage (ICM) course, led by the excellent Phillip Badnell. Here’s where I have a confession, during my ICM course I noticed that the location the course was being delivered from was also a test centre. Now I figured that I had a good background in vSphere technologies, I’ve been using the product since ESX 2, installed and managed large Vi3 multi tenanted deployments, overseen upgrades from vSphere 5 to 6, Studying hard in my Lab and Hands On Labs and of course been pulling together study guides, I should have this! 2V0-622 chewed me up and spat me out. Well that’s not strictly speaking true, I just failed the exam. With the scoring methods (a scored of 300 required out of 500), it’s difficult to say how close I came to a pass, but in my head the difference was perhaps one or two questions. I just was not prepared sufficiently, especially with the new 6.5 material. I found there to be a good number of questions on technologies that my studies just hadn’t focused on, in addition to complex questions around VSAN and NFV. Determined not to be too down heartened, I resolved to double down my learning efforts and focus on nothing else for the next week. With that in mind I bought a voucher to take another shot and booked the retake the first available retake day (28th September) after the seven day cool off period (if you didn’t know there is a mandatory waiting time before attempting an exam retake for VMware). I revisited the resources I was using to learn the material and decided that I should use all available materials to help pass the exam, I didn’t want to leave anything on the bench. With that in mind I decided to purchase the 2V0-622 Online practice test delivered by MeasureUp. Now this isn’t a cheap option, coming in at an additional £100, and I expected quality for that price. Unfortunately, I don’t think that the practice test delivers on that expectation. From a very basic point of view, I don’t understand why the practice test has a different number of questions than the real thing. The exam is 70 questions, the practice test 85. It might be a minor thing but still annoying, it is not a certification simulation if the parameters are different! Also, with the exam scoring being based on the 300/500 values, why is the practice test setup and scored in %, with an arbitrarily set value of an 80% pass rate? Most importantly, I also believe that the difficulty and complexity of the questions was not comparable to the exam. In my opinion the VCP-DCV 6.5 exam goes into an incredible amount of detail in any number of technologies that make up the SDDC stack. In my opinion the MeasureUp practice test only really scratches the surface and does not go into the granular detail that passing 2V0-622 requires. As you might guess, I’m not a fan of the MeasureUp practice exam. I would recommend utilising the free resources first, especially those from Simon Long and Trancender (free with Pluralsight), before spending money on this practice test offering. I sat my second attempt at this exam yesterday. I’m happy to say that the extra focus and revision I put in over the past week paid off and I passed! I’m awaiting official confirmation in the certification portal (can take 10 days). If you have been reading my website, then you might be aware that in the last few months I’ve sat multiple exams. I attained my TOGAF certification and I also passed three Microsoft exams 70-532, 70-533 and 70-534 to gain my MCSE in Cloud Platform and Infrastructure. Only in 2V0-622 did I feel like every question was critical to my eventual success in passing the exam. Some of that might come from pressure that I placed on myself, but a good deal of it came from this exam genuinely being the toughest of the 5 I’ve taken this year. With the TOGAF exams, many of the answers where black and white, with some obvious incorrect choices. With the Microsoft exams, I felt that if you kept your cool and used logic, that would get you more than half way toward a correct answer. With 2V0-622, there were almost no easy questions, with most questions requiring a level of focus, understanding and comprehension beyond what I’d encountered so far this year. To quote the boy scouts, if you are planning to take 2V0-622, be prepared!